One of the more poignant moments in After Life – and there are many – occurs when protagonist Tony is standing by the grave of his wife, Lisa, speaking with elderly widow, Anne. Anne reflects with some gratitude about how she had spent 45 years with her husband Stan, whose grave lies beside Lisa’s. It is with a real sense of the years stolen from him that Tony (Ricky Gervais) responds, ‘I didn’t get that long’. Many of us imagine that we will grow old beside the person we love, becoming one of the sweet old couples you see sharing a bag of chips together at the seaside. Sadly, life all too often doesn’t work out this way, with many people left grieving the loss of their spouse or partner long before the careworn wrinkles set in. Tony in After Life is perhaps one of the most tortured characters in modern TV history, with his anger directed towards everything from the postman to live comedy to banal local news stories. He finds himself feeling without purpose or drive without Lisa, viewing every opportunity for enjoyment or exchanging social pleasantries to be pointless. Once known to worry about what others at a party might think of him, a newly bereaved Tony initially treats others with disdain and mockery, viewing his apathy towards life as a ‘superpower’. It is only when he realizes how he might be able to find joy in making others happy that he begins to turn a corner. I’m a widower. You nailed it. Thanks. Last weekend, I was inundated with messages from members of our charity – WAY Widowed and Young – telling me that I must watch After Life on Netflix. I binge watched it all in one go. It was brutally honest, heartbreaking and hilarious – all at the same time. Many of our charity’s members have said that the script is a searingly accurate reflection of what it’s like to be widowed at a young age. It’s not an easy watch but we hope it will help people to understand the challenges facing people who’ve been widowed young – and that it will help young widows and widowers to reach out to others and find peer support through charities like WAY Widowed and Young. Tony is a difficult, curmudgeonly character, regularly crossing boundaries and causing hurt or offence. However, he is also heart-rendingly real, with his every word and action etched with the pain of his loss. Plenty of young widowers have spoken of how they can relate to the raw, agonizing grieving process depicted in After Life, empathizing with the way Tony rages against the world. I just finished watching After Life, the new Netflix series by Ricky Gervais about someone who’s just lost their wife to cancer. As someone in the same boat, eight months widowed, it’s astonishing how well he’s captured this life. It almost feels like I wrote the script. As depicted in After Life, being widowed as a young man may bring some different challenges than if one was older. Tony is still of working age, and treats his journalism job – which he once enjoyed – with open resentment. His kindly boss/brother-in-law is patient as Tony grapples with the enormity of his grief, but this is sadly not the situation many young widowers will find themselves in. Despite not having children himself, Tony also has responsibilities. His elderly father has dementia, and he is sometimes tasked with caring for his young nephew. 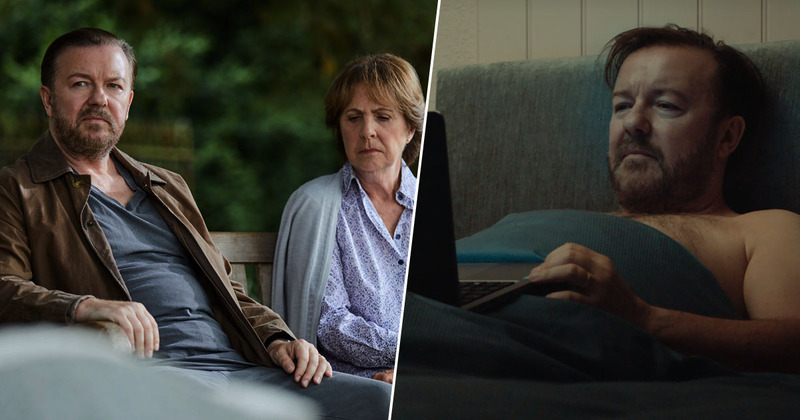 Ricky Gervais’s new TV series, After Life is a very honest and raw account of grief. It also highlights some of the challenges young widowers are faced with after the death of a partner. Sometimes people can assume that if your partner dies when you are young that it will be easy to ‘move on’ and find love and happiness again. Unfortunately there is no quick fix and it may take some time before the person who is bereaved is ready to adjust to life without the person who has died. There can also be the assumption that because you weren’t married or together for many years, you aren’t in as much pain as someone who was with their partner for most of their lives. This can be very upsetting for people who are grieving. Finding time to grieve can also be a challenge for younger people, those in work and with children have responsibilities that can’t be put on hold which can make it incredibly difficult. Few have had as much impact on British comedy as Ricky Gervais, with his observations of the everyday elevating the ordinary with his philosophical outlook and dry wit. Now he has shown how well-written comedy can be used to tackle serious issues, acknowledging those who have suffered and telling their stories. After Life is currently available to watch on Netflix. If you’ve been affected by any of these issues, and want to speak to someone in confidence, please don’t suffer alone. Call Samaritans for free on their anonymous 24-hour phone line on 116 123.